Walking requires the effective transfer of force between the lower extremity and the supporting surface. This transfer of force is accomplished by a diverse group of muscles and tendons collectively known as the CT band. CT band anatomy, biomechanics and dynamics are introduced in this paper. The pathomechanics of the CT band, called CT band syndrome, is also described. Plantarflexion at the ankle is accomplished by eight different muscles and tendons. Collectively, these muscles, tendons, their origins and insertions are called the CT band. The CT band is a lever that transfers vertical force to a horizontal surface. The abbreviation CT describes the span of this anatomical band extending from the calf (C) to the toes (T). A lever accomplishes work by delivering force from an effort arm, through the lever, to a resistance arm. The CT band performs work by delivering force from the calf to the forefoot. This task is performed over and over again as we walk. Disproportionate, excessive, or repetitive loading of any segment of the CT band will result in injury. These injuries are collectively called CT band syndrome. Figure 1 Schematic of the CT band. 1. The gastrocnemius muscle and Achilles tendon. 2. The soleus muscle and Achilles tendon. 3. The posterior tibial muscle and tendon. 4. The peroneus longus muscle and tendon. 5. The peroneus brevis muscle and tendon. 6. The flexor hallucis longus muscle and tendon. 7. The flexor digitorum longus muscle and tendon. 8. The plantaris muscle and tendon. The lumbricales and interosseous muscles. 3. Bones and joints of the foot. The fulcrum of The CT Band is the joint axis of the talo-crual joint. CT band biomechanics can be broken into two categories: kinetics and kinematics. Kinetics is the study of motion with respect to force and load. Kinematics is the study of motion without respect to force or load and deals with the fundamental concepts of space, time, velocity and acceleration. A. Primary force – force generated by the muscles of the CT band. A. Static load – Static load refers to body weight. B. Non-static load – variable load. Examples of non-static load would include a backpack on a hiker, a mother carrying an infant or a worker carrying materials specific to his or her job. Figure 2 Eccentric muscle contraction. Eccentric contraction plays a vital and dominant role in CT band biomechanics. Voluntary eccentric contraction can generate more muscle tension during eccentric muscle group action than what is measured during voluntary concentric or isometric contraction.8 More importantly, the amount of work required by skeletal muscle for eccentric contraction is far less than that required for concentric contraction. This finding was confirmed by electromyography (EMG) studies noting that less EMG activity is present for eccentric contraction as compared to concentric contraction lifting the same load. The CT band takes advantage of this unique, energy saving characteristic of eccentric contraction. It is important to recognize that eccentric rather than concentric contraction dominates CT band biomechanics. Concentric contraction is also called positive work or positive contraction. (Fig. 3) A concentric contraction produces work as a muscle shortens. CT band concentric contraction occurs during short bursts of activity where quick and abrupt action is required. As previously noted, concentric contraction requires the expenditure of more energy compared to eccentric contraction. Figure 3 Concentric muscle contraction. 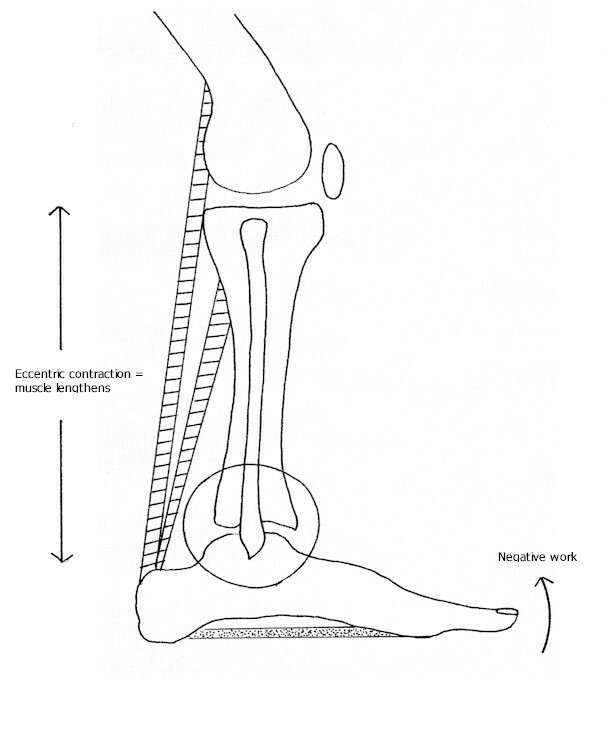 Additional force is generated by the extrinsic plantar flexors of the lower leg. 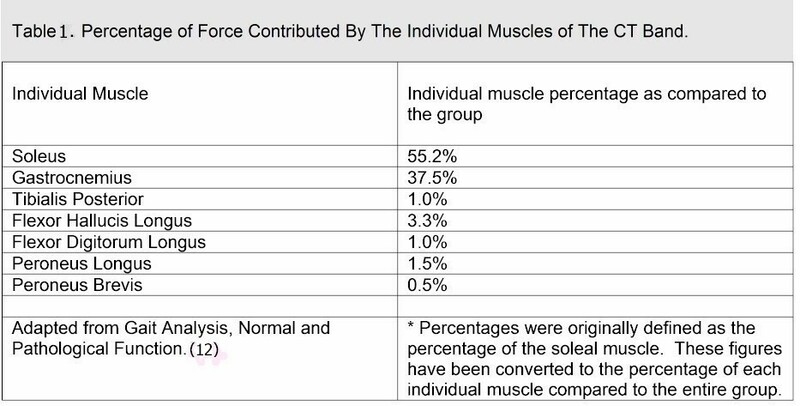 Table 1 describes the percentage of force contributed by each of the muscles of the CT band. 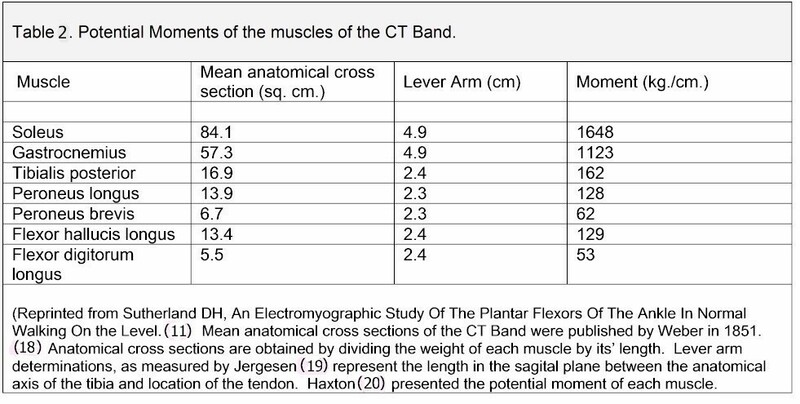 Table 2 describes the anatomical cross section, lever arm and potential moments of each of the muscles of the CT band. Tables 1 and 2 show data based exclusively upon concentric muscle contraction of the CT band. Similar testing has not been performed to assess eccentric muscle contraction of the CT band. Until more in-depth studies of eccentric muscle contraction can be performed, we must assume that the properties of both concentric and eccentric contraction are similar. For instance, the subset of data in Tables 1 and 2 would not change when evaluating the same muscle for eccentric vs. concentric contraction. The size of the muscle, the lever arm and even the direction in which the force is being applied to the muscle is the same. The only difference would be the direction in which the muscle is changing: shortening (concentric) or lengthening (eccentric). The individual kinetic properties of the CT band are difficult to isolate and define in vivo. Static and non-static load are the exception in that they can be defined and measured. Table 1 Percentage of Force Contributed By the Individual Muscles of the CT Band. Table 2 Potential Moments of the muscles of the CT Band. Primary and secondary force will vary with activity, rate of gait and variations in types of walking surfaces. Secondary force was estimated by Spoor to be 25% of the total work performed by the CT band at the level of the ankle. Eccentric and concentric contraction will also vary in response to situational needs such as rate of gait or changes in walking surfaces. It’s important to recognize that the kinetic properties of the CT band are dynamic, responding to situational needs with each and every step. The three kinematic properties of CT band biomechanics are planal dominance, rocker mechanics and rotational placement of the foot. Levers work most effectively in a single body plane. Linear motion in a single plane is called translation. Deviation of the lever from a single plane results in rotation and a subsequent attempt by the lever to regain single plane function. Figure 4 shows examples of an effective and ineffective lever based upon planal dominance and rotation. Figure 4 Planal dominance of levers. Rotation does occur within the CT band but is typically compensated for by reciprocal or compensatory motion within the lower extremity. For example, transverse plane motion occurs between the leg and supporting surface during gait. The leg moves from an internally rotated position at heel strike to an externally rotated position at the toe off phase of gait. This transverse plane rotation is accomplished proximally by rotation of the pelvis. Distal compensation is accomplished by motion at the subtalar and midtarsal joints. Although the transverse plane relationship between the leg and the floor changes, the CT band continues to perform with sagital plane dominance throughout gait. This relationship can be described as translation with compensated rotation. Figure 5 shows graphic examples of translation within the sagital plane and rotation in the frontal and transverse planes. The greater the ability of a lever to function within a single plane, the more effective the lever will be. However a rigid lever is a lever that is unable to absorb strain or adapt to variations in applied load and supporting surfaces. CT band biomechanics requires a degree of rotation to adapt to a constantly changing environment. 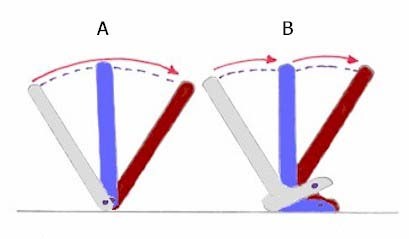 Rotation is the quality of the CT band that enables the foot and leg to (1) absorb stress as a flexible structure (2) deliver force as a rigid structure and (3) adapt to uneven surfaces. Sutherland was the first to describe the unique function of rockers in the foot and ankle. Figure 6 A shows the excursion that the knee would incur without a foot. 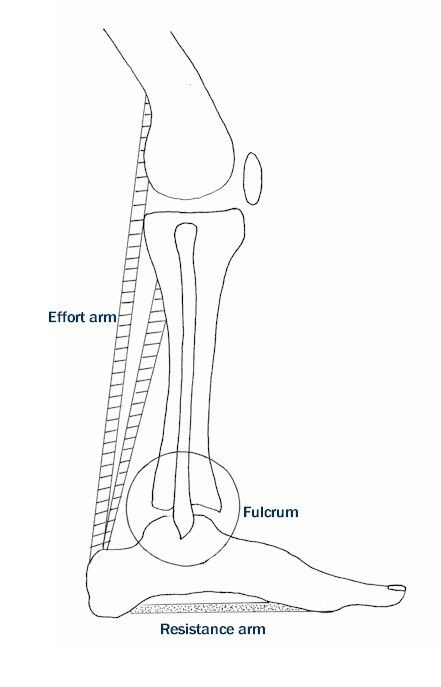 Figure 6 B shows the excursion of the knee without and ankle. Figure 6 Showing rocker function (A) without a foot and (B) without an ankle. 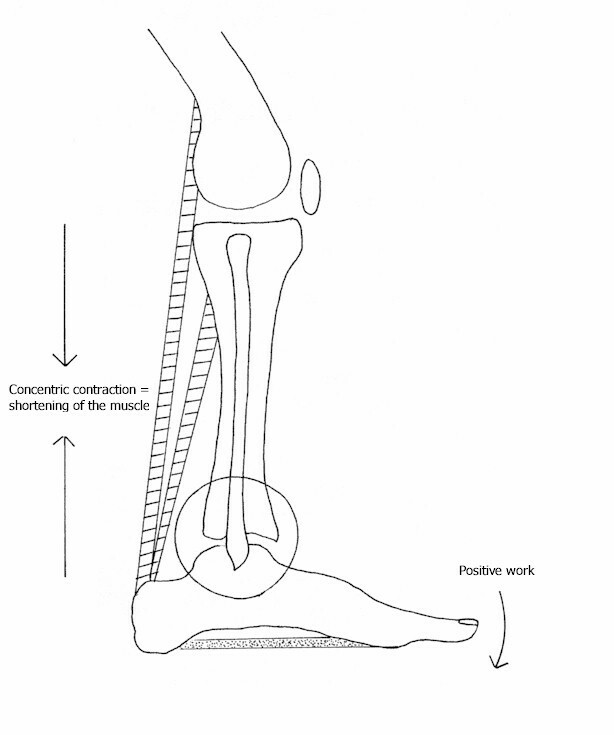 The combined effect of all three rockers of the foot and ankle are better exemplified in Figure 7. Figure 7 Showing normal rocker function. Multiple, serial rockers are an effective way to transfer mechanical force and load while minimizing the body’s expenditure of energy. The CT band uses three rockers in a series to effectively move the body’s center of mass forward over the foot. The heel rocker and ankle rocker initiate translation at heel contact. Heel rocker translation ends at the beginning of the midstance stage of gait. Ankle rocker function continues, constantly maintaining a position related to, and usually beneath the body’s center of mass. The ankle rocker continues forward progression until 10 degrees of dorsiflexion is achieved at the ankle. As the heel-off phase of gait begins, the ankle rocker transfers motion to the forefoot rocker. The forefoot rocker continues translation until the toe-off phase of gait is complete. Figure 8 Transverse and oblique axis of the forefoot. Reprinted with permission from Gray’s Anatomy, W.B. Saunders Company. 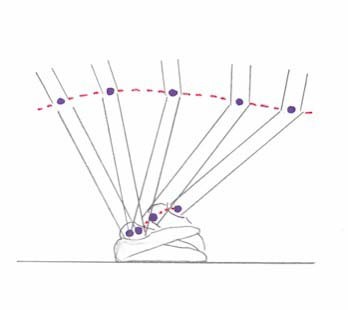 Abduction or external rotation of the foot results in the predominant action of the transverse axis of the forefoot. The transverse axis consists of the first and second metatarsal heads. The transverse axis lengthens the CT band resistance arm and is employed when high angular velocity of the CT band is the desired moment about the ankle joint. Activities that would benefit from use of the transverse axis include a brisk walk or the initiation of running. Adduction, or internal rotation of the foot results in the predominant action of the oblique axis of the forefoot. 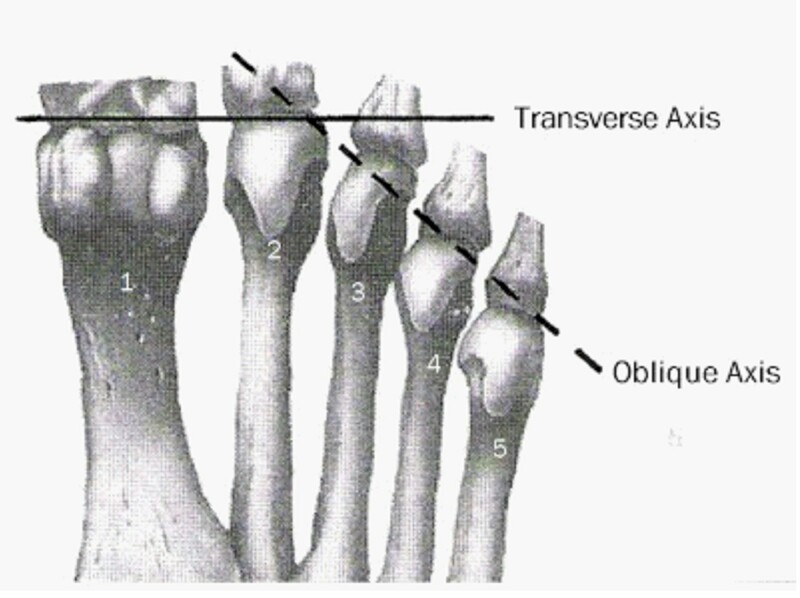 The oblique axis runs between the second and fifth metatarsal heads. The oblique axis shortens the resistance arm and is used when low angular velocity of the CT band is desired. Examples of lower angular velocity would include slow, sustained walking or resisting heavy loads for sustained periods of time. Table 3 is a summary of the changes in the CT band caused by rotational placement and change in the forefoot axis. 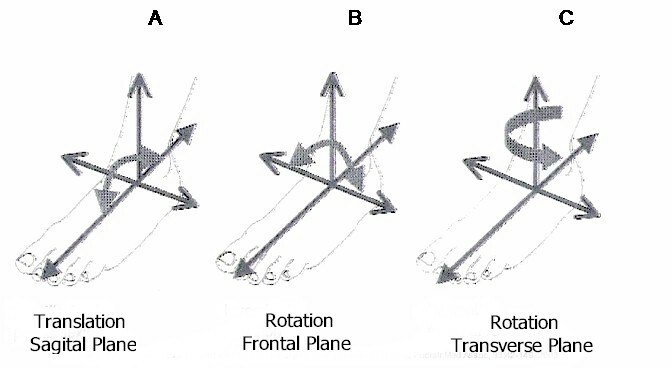 Table 3 Comparison of forefoot axes formed by rotational placement of the foot. The rotational placement of the foot changes with each step. Carrier speculated that the rotational placement of the foot varied to accommodate and sustain the work of the CT band. Carrier’s theory suggests that the resistance arm length is optimized in response to the ground reactive force (GRF). Change in rotational placement of the foot is necessary to accommodate different characteristics of human movement. Alteration of walking speed or walking surface will necessitate variations in rotational placement. For instance, Shorten described variation in the rotational position of the resistance arm of the CT band at different walking speeds. It appears that the rotational placement of the foot is determine by both (1) the need to optimize and minimize work by the CT band and (2) the need to accommodate variations in walking speed or walking surfaces. Observation of rotational placement in different activities has been studied and has resulted in contradictory results. [31-33] Each of these studies has relied upon the definition of walking and running to be the result of active push-off theory as defined by Winter and Kepple. [13,33] For instance, the transverse axis has been described in Table 3 as the axis that would result in the greatest angular velocity around the ankle and subsequently, higher resistance to GRF. It would stand to reason that the transverse axis would be the optimal axis for sprinters. Fuchs and Staheli found contradictory evidence noting that many high school sprinters have in-toed gait.34 Sprinting is accomplished by placing the body’s center of mass far ahead of the center of pressure (COP) of the GRF. Therefore, sprinting cannot be simply described by active push-off theory. Instead, we need to recognize sprinting as a controlled fall that incorporates both the controlled roll-off theory of Sunderland and Skinner [11,35] and the active push off theory of Winter and Kepple. [13,33] The role of rotational placement of the foot therefore varies by situation and demand. The transverse and oblique axes are not mutually exclusive of each other, but rather work together to optimize sustainable CT band biomechanics based upon immediate needs. These conflicting theories make it apparent that additional research is required to clarify this topic. O’Connell stated that “living muscles do not act singly, but in groups, their integrated activity resulted in coordinated movement patterns.”  Understanding CT band biomechanics requires an acceptance that the CT band is not made up of independent, isolated structures, but instead consists of many structures working as one unit. The CT band accepts force and load from multiple proximal sources and distributes that force and load to many distal structures using the kinetic and kinematic properties previously described. The functional integration of these kinetic and kinematic properties is called CT band dynamics. The primary dynamics of the CT band are the restraint of forward motion of the tibia on the talus and the conservation of work performed by the body by maintaining the body’s center of mass upright and within the sagital plane. Restraint of forward motion of the tibia on the talus is accomplished by eccentric contraction of the CT band. Eccentric contraction of the CT band slows the tibia as it moves forward over the ankle rocker. Eccentric contraction is a more sustainable muscular function, requiring far less work than concentric contraction. [4,7] As an example, if we look at the function of the biceps muscle, it is much easier for the biceps muscle to lower a weight (eccentric contraction) than it is to raise a weight (concentric contraction). The CT band takes advantage of this biomechanical advantage and conserves energy through sustained, slow eccentric contraction. The secondary dynamics of The CT Band include stability of the knee, ankle, subtalar joint, midtarsal joint and metatarsal phalangeal joints. Kinetics, as previously mentioned, is one of the two properties of CT band dynamics. The kinetic properties of the CT band are dictated by skeletal muscle. Skeletal muscle functions as a motor, a spring, a shock absorber and a stabilizer. In human biomechanics, skeletal muscle normally assumes only one of these functions. The CT band is unique in that it can assume one or several of these functions simultaneously. The CT band functions primarily as a stabilizer, limiting the forward excursion of the tibia. However, eccentric contraction of the CT band may be converted to elastic energy and released as positive work (concentric contraction). This action can be compared to a spring. Hof described this phenomenon which is very pertinent to CT band biomechanics. As the tibia moves forward over the ankle rocker, the CT band is storing energy that will be transferred to the forefoot rocker. It is interesting to note that EMG studies have found that the CT band doesn’t actually contribute to active push off at the toe off phase of gait. At toe off in normal gait, the amount of force delivered by the CT band rapidly diminishes, resulting in no active push off by the CT band. The elastic energy stored in the CT band during the midstance phase of gait is used to maintain a final isometric contraction at the forefoot rocker prior to the toe off phase of gait. This isometric contraction is much like a spring and a shock absorber. In cases where aggressive forward locomotion is needed, the CT band will switch from eccentric to concentric contraction and function as a motor. With this change to concentric contraction, the CT band changes from isometric to isotonic contraction. Therefore, the skeletal muscle in CT band dynamics is unique in that it functions as a motor, a spring, a shock absorber and a stabilizer. Neptune astutely recognized that these theories may not be mutually exclusive. Central to each of these theories of gait is CT band dynamics. The inability of the CT band to sustain repetitive load may result in injury to one or more of the components of the CT band. (Fig. 9) These injuries are called CT band syndrome (CTBS). Factors that contribute to CTBS may be physiological, mechanical or a combination of both. 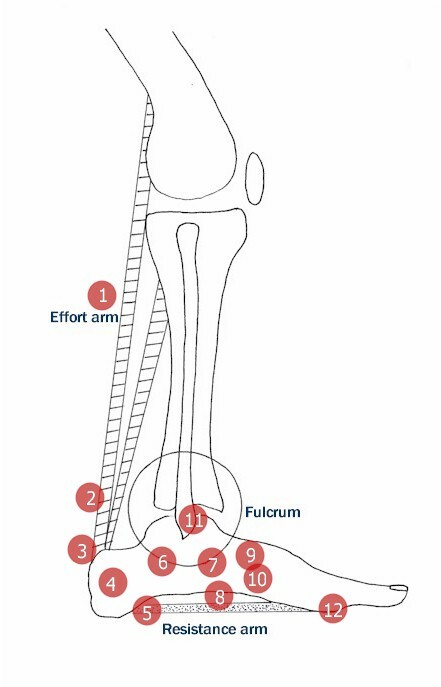 Figure 9 CT band syndrome- common locations of pathology along the CT band: (1) calf cramping and stiffness secondary to equinus, (2) chronic Achilles tendonitis and micro tears of the Achilles tendon, (3) insertional Achilles tendonitis, (4) Sever’s Disease, (5) plantar fasciitis, (6) tarsitis, (7) posterior tibial tendon dysfunction, (8) peroneal tendonitis, (9) Lisfranc’s joint arthritis, (10) Charcot joints, (11) flat top talus and chronic ankle pain (12) forefoot bursitis, capsulitis and ulcerations. • Weight gain and obesity. • Increased repetition of load. • Increased duration of load. • Increased amount of load. CT band syndrome has a translational (CTBS-1) and/or rotational (CTBS-2) basis for its onset, continued presence or recurrence. Injuries that are the result of sagital plane, longitudinal strain within the CT band. Common CTBS-1 conditions would include plantar fasciitis, Achilles tendonitis and Sever’s disease. CTBS-2a – The cause of rotation. Intrinsic conditions or deformities that contribute to rotation and shear strain within the CT band. Examples include PTTD, metatarsus adductus, calcaneal varus, calcaneal valgus, etc. CTBS-2b – The effect of rotation. Injuries that are the result of a causal relationship that is dependent upon (a) the presence of CTBS-2a and (b) the addition or input of a stressor that has a negative effect on pre-existing CTBS-1. Stressors may be physiological or mechanical. When load is applied to the CT band, tissue within the band will undergo stress. Sustained CT band function requires ongoing physiological management of stress. CT band syndrome occurs when the CT band is unable to repair accumulated stress resulting in strain of soft tissue or bone. CTBS-2a deformities promote uncompensated rotation of the CT band. As load, force or other stressors are applied to the CTBS-2a deformity, shear strain develops resulting in CTBS-2b injuries. Stress risers within the CT band are a contributing cause of CT band syndrome. Stress risers are focal areas where stress is potentiated with applied load or force. Stress risers absorb force and limit the effective transfer of force from the effort arm to the distal aspect of the resistance arm of the CT band. Examples of stress risers within the CT band may include but are not limited to arthritis, tendon injuries and stress fractures. Structural deformities of the foot (CTBS 2-a) can contribute to rotation and become inherent stress risers with repetitive use. Tissue elasticity and its’ relationship to injury and healing is a significant variable to be considered in CTBS. In addition to the primary musculo-tendinous structures of the CT band, force is carried by numerous other structures including ligaments, joints and bone. The elasticity of these structures is essential to sustained CT band function. These structures participate in CT band dynamics by resisting, transmitting and absorbing force. Tissue elasticity is the ability of tissue to accommodate stress and is known to decrease with age. Therefore, we can assume that CT band syndrome will be more prevalent in aging, yet active patients. Repetition in CT band dynamics may be a contributing cause of CT band syndrome. In existing CTBS-1 and CTBS-2b, failure to address CT band dynamics may be considered a factor that perpetuates the injury. Therefore, CTBS can be considered a form of repetitive use syndrome. • Forefoot and rearfoot rocker shoe modifications. • Laced leather uppers on shoes. • Stiff leather sole shoes. • Leather Oxfords Thomas heels/reverse Thomas heels. • Lateral and medial flair. • Medial or lateral column shortening or lengthening. • Triple arthrodesis with or without wedging. In conclusion, lower extremity biomechanics has traditionally been taught in a way that we learn to look at function as a single muscle and pathology as an isolated problem. Defining the CT band and CT band syndrome enables providers to view lower extremity biomechanics based upon lever mechanics. The CT band is an example of a lever where “living muscles do not act singly, but in groups, their integrated activity resulted in coordinated movement patterns.”  This integration of anatomy, kinetics and kinematics is called CT band dynamics. CT band syndrome is described as a group of related conditions and injuries that share as their common denominator, the CT band. Factors contributing to CTBS may be mechanical, physiological or a combination of both. CTBS is often an overuse syndrome common to the aging yet active patient population. CTBS can be predominantly translational (CTBS-1), rotational (CTBS-2) or a combination of both. CTBS-1 is a translational injury that occurs due to longitudinal strain within the sagital plane. CTBS-2 describes shear strain injuries that result from rotation. CTBS-2a represents the intrinsic cause of ration while CTBS2-b describes the shear strain injury due to rotation. Acknowledgments – The author wishes to thank Michael Forman, DPM, Cleveland, Ohio for his critical review of this paper. The author would also like to thank Thalia Oster for her support, encouragement and editorial focus. 12. Perry J. Gait Analysis: Normal and Pathological Function. Thorofare, NJ: Slack Inc; 1992. 19. Jergensen FH. Studies in Various factors influencing internal fixation as a method of treatment of fractures of long bones. Report to National Research Council Committee on Veterans Medical Problems, Contract number V1001M-1945, Jan. 5, 1950-July 1, 1951. 25. Inman et al: Human Walking, Williams and Wilkens, Baltimore 1981. 26. Simon SR, Mann RA, Hagy JL, Larsen LJ. Role Of The Posterior Calf Muscles In Normal Locomotion. J Bone J Surg 60A, 465-472, 1978. 30. Shorten MR, Eden KB, Himmelsbach JA. Plantar pressures during barefoot walking, XII International Congress of Biomechanics, Los Angeles, 1989. 34. Fuchs R, Staheli LT. Sprinting and intoeing. J Pediatric Orthop 1996;16:489-91. 36. O’Connell AL. Electromyographic Study Of Certain Leg Muscles During Movements Of The Free Foot And During Standing. 37. Stauber WT. Eccentric action of Muscles. Exercise and sport science reviews 17 157-185, 1989. 38. Hof AL, Geelen BA, Van den Berg JW. Calf Muscle Moment, Work and Efficiency In Level Walking; Role of Serial Elasticity. J Biomechanics 16:523-537, 1983. 42. Frankel VH, Burstein AH. Orthopedic Biomechanics. Philadelphia, Lea & Febiger, 1970. 1 Private practice, Granville, Ohio 43023. This entry was posted in Uncategorized and tagged CT band, CT band biomechanics, CT band dynamics, CT band syndrome, Uncategorized. Bookmark the permalink.